Make greetings for every occasion and share them with friends/loved ones. A package consisting of Christmas & New Year Template Library, Thanksgiving & Hanukkah Template Library and St. Patrick’s Day, April fool’s Day & Easter Template Library. 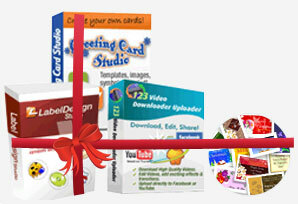 Greeting Card studio: Create cards in no time; Make foldable cards or single page cards. Label Design Studio: Make CD/DVD Labels, Addressing, Business cards, Brochures and more! 123 Video Downloader Uploader: Download ,edit and share your videos with ease! 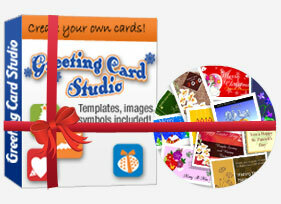 Greeting Card Studio: Create cards with ease; Make foldable cards or single page cards. If you find a greeting card creation software that performs better than Greeting Card Studio, please send us your bill for the Greeting Card Studio software you bought. We will refund every cent you paid for it- no questions asked!